I saw that I was dressed as an altar boy in the Monastery,** and was helping the Saint in the church. Straightaway, I saw that wild men with turbans on their heads, entered, holding clubs, sticks and swords. And from my fear I trembled, and I hid, gazing with agony on what was occurring. All of them, screaming loudly, seized the Saint, and having tied him to the tree,*** began to beat him, and to pierce him with their swords, and his blood ran onto the ground. 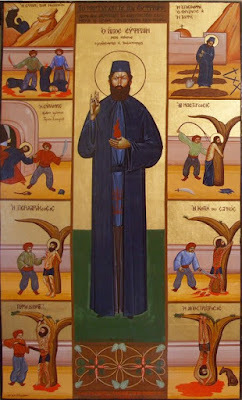 They martyred him unspeakably, cutting his body into little pieces, while the Saint in return, looked to heaven with his eyes and prayed. Furthermore, next to him was a small puppy who was barking, and tried to free him, while the tyrants chased him. From my fear and my agony, as I was watching this life-like retelling of the martyrdom of Saint Ephraim, I awoke, but when I fell asleep a short time later, the dream continued. 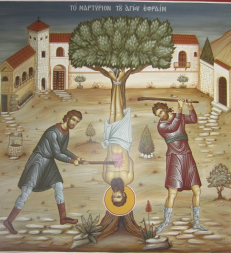 I did not see the tyrants anymore, but only the Saint, bound on the tree (which exists to this day), drenched with his blood, gnarled everywhere, but he was not living anymore, he had died. * Recorded in the 3rd volume of publications of the Holy Monastery describing the miracles of the Saint. ** Monastery of the Annunciation on Mount Amomon in Attica. *** A mulberry tree, believed to be that on which the Saint was hanged, is today shown as an object of veneration inside the re-erected monastery.